Working in the City now means I've become a part of the Commute. I've mentioned before, I'm not a morning person so finding ways to boost my energy and keep me going is one heck of a priority. Having heard about my love for tea, Kiss Me Organics recently approached me to try out their organic matcha green tea. I love matcha, yet surprisingly it's one of the few teas I don't regularly replenish in my cupboard of teas and coffees. Matcha green tea has become incredibly popular in the last few years and now as we fight the January blues and move on to Fit February, there's been a lot of noise about the magical powers that matcha possesses, especially as matcha is considered to be a calorie burning and energy booster. I for one love matcha. Compared to other teas, it is so easy to use because it's a loose leaf tea that dissolves in liquid. There's none of the steeping tea, throwing away tea bags or loose leaf tea malarky. Because of this, it makes matcha incredibly versatile to use; you can put it in lots of different things like porridge (Honestly Healthy has a healthy and seriously deeelicious recipe) , mocktails, cocktails, smoothies, protein shakes, cupcakes and lattes. I usually reserve smoothies for the summer because I just find it far too cold to drink them in the winter! But if you're the complete opposite to me, why not try out my favourite matcha green tea smoothie recipe: almond milk, one teaspooon of matcha and one banana. Now, as you probably know by now, I'm a T-total ("boring! ", I hear you say) so I like (to think) I'm living on the edge by having my matcha straight up on the rocks; one teaspoon of Kiss Me Oranics Matcha with hot water...'cor blimey, I'm living dangerously. Sometimes I like to vary the taste by adding another teaspoon of matcha....you know, because I like mine to be tall, dark and - ok enough with the boyfriend joke! Whisk the matcha though, as stirring with a spoon doesn't dissolve all the matcha. In the mornings, this has given me a great boost of energy. Exactly what the doctor prescribed for morning grumpiness. If you've never had matcha before, where have you been? No, but seriously, if you haven't had it before, it can be an acquired taste. It is much more different than 'normal' green tea, a little sweeter I would say. Adding agave nectar or honey is great to add if you're not too keen on the pure matcha tea drink I mentioned before. I remember the first time I came across Matcha green tea cupcakes a few years ago. I used to be obsessed with cupcakes - baking them or eating them. We had just bough one of the Hummingbird's Bakery recipe books, and I had seen a matcha cupcake recipe. How many times do you see green cupcakes? I whipped up a batch of them and they were divine. What I love about Kiss Me Organics is that the purchase of their organic matcha green tea also comes with a free e-recipe book, which you obtain after purchase. The book is amazing because it covers a variety of recipes; from smoothies to cocktails to lattes to cupcakes. So, if you're hosting a dinner or looking to make drinks for a party, Kiss Me Organics has you covered. Matcha cocktails are so unusual, if I could, I would love to be able to try these out. I've been making quite a few matcha lattes with the Kiss Me Organics tea, as an alternative to my Sunshine Milk, and I have to say, I'm abso-LATTE-ly loving them ;). The way I've made them is similar to my cappucinos. I pour boiling water into a third of a glass, and whisk in the matcha green tea. Then I boil the milk and put that into a cafetiere and keep plunging until the milk has thickened and become foamy. After that, I pour the milk into the glass and attempt some latte art! I add a little bit of agave nectar and it's one of the best hot drinks to have in the evening after work. My only gripe was the size of the packaging; the tea comes in a large packet, giving the allusion that it's filled to the near top. In fact only half the packet contains matcha green tea. However, the amount in the packet does go a long way and does last a long time and the fact it's in a re-sealable bag gives it extra brownie points. 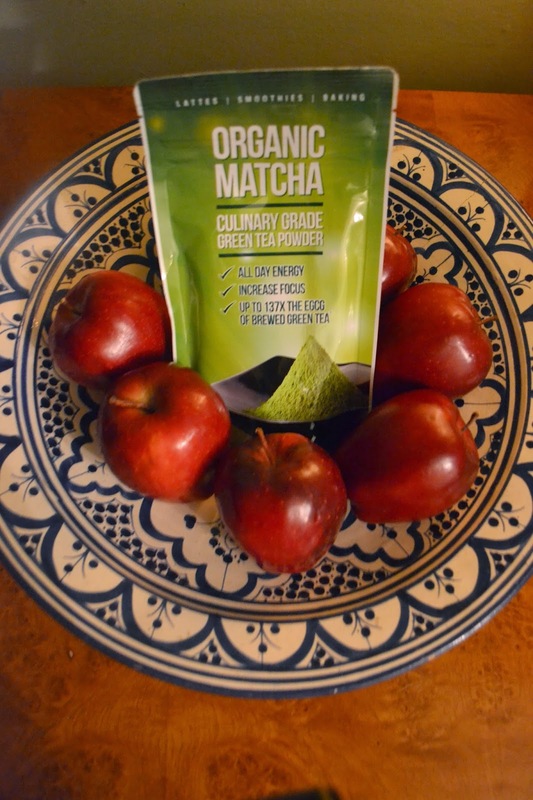 Kiss Me Organics' Organic Matcha Green Tea Culinary Grade is of great quality. I've found it mixes well and tastes super in food or drinks. I have found that the matcha gave me plenty of energy in the morning, whether I had it in porridge or straight up pure, but I also found it calming in the evenings. As to whether it has improved my hair health, I'm not quite sure. My hair is in a state at the moment (I desperately need to find the time to have a hair cut) so I can't really tell if the matcha has helped in any way. The tea is pricey, but then matcha tea quite often does break the bank compared to other teas. Yet, given that this is organic matcha tea and comes with an e-recipe book, the price is justifiable. Kiss Me Organics was a matcha made in heaven ;). If you want to increase your energy in the morning, reinvigorate yourself after a workout, want better skin health or are simply very curious about matcha, Kiss Me Organics is a brand you should try out. What's your favourite thing you love to make with matcha? Let me know, by dropping a comment below or tweeting me. Disclaimer: Kiss Me Organics sent me the Organic Matcha green tea to review. However, all opinions are honest and my own.